Heidi Klum and Tom Kaulitz are all set to get married! The model, 45, took to Twitter on Monday, December 24, to announce her engagement to her loving boyfriend. 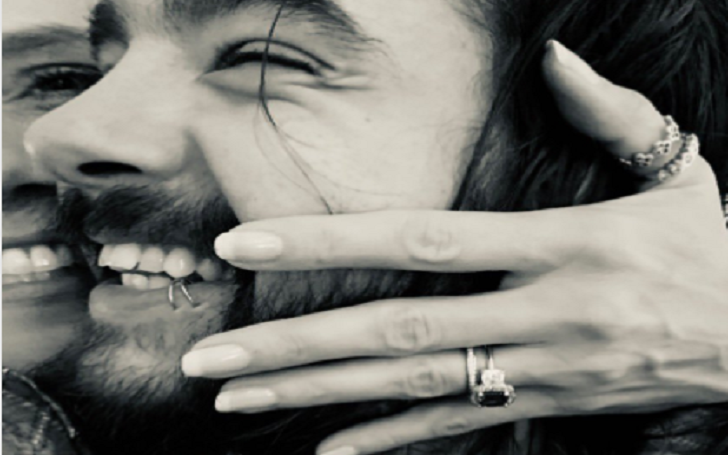 Alongside a black-and-white photo of the newly engaged couple, in which she showcased her stunning engagement ring, all smiling, she wrote, "I SAID YES", adding a red heart emoji. During an interview with Us Weekly in October, the Project Runway alum host teased taking her relationship with the Tokio Hotel guitarist, 29, next level. She told the publication at the time, "Let’s see! Time will tell. We haven’t been together for that long. We only just met in February." Heidi previously dated Flavio Briatore, with whom she shares daughter Leni, 14. She was also previously married to ex-husband Seal, with whom she shares Henry, 13, Johan, 11, and Lou, 9. When asked if her kids like Tom, the model told Us Weekly, "Yeah, they do!" Days before their engagement announcement, Heidi and Tom, who made their red carpet debut as a couple at the amfAR Gala Cannes at Hotel du Cap-Eden-Roc in France in May, were spotted together during their trip to Mr. Chow in Beverly Hills and they looked so in love. Congratulations to you two guys! We are eagerly waiting for your wedding!